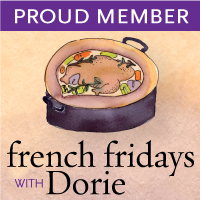 As I was getting out my copy of AMFT to check the recipe for the week, I told Paul that I couldn't wait to read the story Dorie came up with to explain the presence of a corn on the cob recipe in a French cookbook. Paul has spent some time in France and we have good friends who are French, and they had all told me that in France corn is only used for feeding pigs. Well, Dorie did it again! I love her creativity. As much as we like French food, I think it's so fun that this book also has recipes for corn on the cob, tzatziki, Vietnamese chicken soup...It makes the group so much fun. The story was very cute and she's right, this is the perfect method for cooking corn. We normally grill corn, but roasting has definitely replaced boiling as my rainy day fall-back method. I started with delicious, fresh corn that we got from our CSA the same day, and the roasting only intensified the flavor and made it even more delicious. I served this with Ina's curried chicken salad (quick and easy since I already had some roasted chicken breast in the freezer) and her scalloped tomatoes. The tomatoes were incredible. It's hard to go wrong with fresh CSA tomatoes in August, and this recipe really highlighted their flavor. I have her cookbook, but the recipe is also online here. The only change I made is reducing the sugar to one scant tablespoon. Our tomatoes were so delicious they really didn't need the extra sugar. I love how eclectic this cookbook is too... so glad to hear you like this techinque. I've only read one other post so far that found it changed the flavor. I love the char when grilling but over boiling or microwaving this techinque beats them hands down. I have made some wonderful meals since I started FF's. This corn on the cob is no exception…roasting it was a new method for me, and the corn was cooked perfectly! Looks like a wonderful meal Jora. Agreed - there are some great little finds in AMFT. 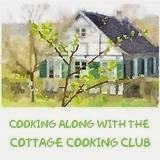 The presence of a corn on the cob recipe in a French cookbook surprised me too! I love the variety in this cookbook, too. Along with Dorie's talent for instructions, it's what makes this cookbook so stellar. Nice accompaniments! Jora, the Curried Chicken Salad and the Scalloped Tomatoes sound wonderful in combination with your Boulevard Raspail Corn - so nice to read that you enjoyed all of this so much and were able to use the freshest of produce that is available right now - I encountered some difficulties when trying to find fresh corn here (not unlike the French, we use it to feed mostly animals)- but in the end I succeeded!